[S1] Ruth Bennett, Naudain Family of Delaware (Geneva, Neb. : n.pub., 1941), pp. 72, 90 (both naming Jacob Van Horn Naudain as her father). This material is a typescript of "notes" in Ms. Bennett's possession and apparently was originally written and compiled by James W. Lattomus. Copies are with the D.A.R. Library, Washington, D.C., and Roger Bartlett, Austin, Tex., and can be viewed at http://www.rabgenealogy.com/ui53.htm. The notes contain some inconsistencies, and page 45 was missing from the D.A.R. Library copy when it was copied. [S1] Ruth Bennett, Naudain Family of Delaware, above, p. 90. [S1] Ruth Bennett, Naudain Family of Delaware, above, pp. 72 (not giving the date), 90 (giving the date). [S1] Ruth Bennett, Naudain Family of Delaware, above, p. 90 (naming Lydia Annie Naudain as her mother). [S1343] Journal-Every Evening, Wilmington, Del., online at http://www.newspapers.com, 1 Nov 1943, p. 10, col. 4 (obituary for Mrs. Rachel Watkins) (naming Mrs. Lydia Naudain Wilson as her mother). [S1] Ruth Bennett, Naudain Family of Delaware, above, p. 90 (naming Lydia Annie Naudain as his mother). [S1337] The Evening Journal, Wilmington, Del., online at http://www.newspapers.com, 23 Jul 1923, p. 1, col. 1 (obituary of Edward V. Wilson) (naming L. Annie Naudain as his mother). [S1340] The Morning News, Wilmington, Del., online at http://www.newspapers.com, 6 Mar 1928, p. 2, col. 3 (obituary for Howard G. Wilson) (naming Mrs. Annie Naudain Wilson as his mother). • Her Find A Grave memorial, which includes a picture of her tombstone, is here. [S1] Ruth Bennett, Naudain Family of Delaware (Geneva, Neb. : n.pub., 1941), pp. 71, 90-91. This material is a typescript of "notes" in Ms. Bennett's possession and apparently was originally written and compiled by James W. Lattomus. Copies are with the D.A.R. Library, Washington, D.C., and Roger Bartlett, Austin, Tex., and can be viewed at http://www.rabgenealogy.com/ui53.htm. The notes contain some inconsistencies, and page 45 was missing from the D.A.R. Library copy when it was copied. [S1] Ruth Bennett, Naudain Family of Delaware, above, pp. 90, 91 (naming Jacob V. Naudain as her father). [S1] Ruth Bennett, Naudain Family of Delaware, above, pp. 90 (giving the date but not the place), 91 (naming the place but omitting the date). [S961] Find A Grave, online at http://www.findagrave.com, memorial for Mary C. Hyland, memorial no. 37264871, viewed on 23 Feb 2012 (giving the year but no other information). [S427] Portrait and Biographical Record of the Eastern Shore of Maryland (New York, N.Y..: Chapman Pub. Co., 1898), p. 131 (giving only the year and spelling her surname as Nordain). [S961] Find A Grave, online, above, memorial for William A. Hyland, memorial no. 37264888, viewed on 23 Feb 2012 (not giving the date). [S961] Find A Grave, online, above, memorial for Mary C. Hyland, memorial no. 37264871, viewed on 23 Feb 2012 (not giving the date). [S427] Portrait and Biographical Record of the Eastern Shore of Maryland, above, p. 131 (spelling her surname as Nordain). [S961] Find A Grave, online, above, memorial for Mary C. Hyland, memorial no. 37264871, viewed on 23 Feb 2012. [S1] Ruth Bennett, Naudain Family of Delaware, above, p. 91. [S427] Portrait and Biographical Record of the Eastern Shore of Maryland, above, p. 131 (giving his name as Harry H. Hyland and naming Mary C. Nordain as his mother). [S1] Ruth Bennett, Naudain Family of Delaware, above, p. 90 (naming Mary Catharine Naudain as his mother). [S427] Portrait and Biographical Record of the Eastern Shore of Maryland, above, p. 131 (naming Mary C. Nordain as his mother). [S427] Portrait and Biographical Record of the Eastern Shore of Maryland, above, p. 131 (giving her name as Annie W. Hyland and naming Mary C. Nordain as her mother). [S1] Ruth Bennett, Naudain Family of Delaware, above, p. 90 (naming Mary Catharine Naudain as her mother). [S427] Portrait and Biographical Record of the Eastern Shore of Maryland, above, p. 131 (naming Mary C. Nordain as her mother). [S961] Find A Grave, online, above, memorial for Elizabeth C. Hyland Wilson, memorial no. 37316085, viewed on 23 Feb 2012 (naming Mary C. Hyland as her mother). [S961] Find A Grave, online, above, memorial for Mary C. Hyland, memorial no. 37264871, viewed on 23 Feb 2012 (naming Mary C. Hyland as her mother). [S1] Ruth Bennett, Naudain Family of Delaware, above, pp. 90-91 (naming Mary Catharine Naudain as her mother). [S1] Ruth Bennett, Naudain Family of Delaware, above, pp. 90-91 (naming Mary Catharine Naudain as his mother). • His 1898 biography in Portrait and Biographical Record of the Eastern Shore of Maryland is here. • His Find A Grave memorial, which includes a picture of his tombstone, is here. [S1] Ruth Bennett, Naudain Family of Delaware (Geneva, Neb. : n.pub., 1941), p. 71. This material is a typescript of "notes" in Ms. Bennett's possession and apparently was originally written and compiled by James W. Lattomus. Copies are with the D.A.R. Library, Washington, D.C., and Roger Bartlett, Austin, Tex., and can be viewed at http://www.rabgenealogy.com/ui53.htm. The notes contain some inconsistencies, and page 45 was missing from the D.A.R. Library copy when it was copied. [S427] Portrait and Biographical Record of the Eastern Shore of Maryland (New York, N.Y..: Chapman Pub. Co., 1898), p. 130 (naming Henry M. Hyland as his father). [S427] Portrait and Biographical Record of the Eastern Shore of Maryland, above, p. 130 (naming Maria Grant as his mother). [S427] Portrait and Biographical Record of the Eastern Shore of Maryland, above, p. 130. [S961] Find A Grave, online at http://www.findagrave.com, memorial for William A. Hyland, memorial no. 37264888, viewed on 23 Feb 2012 (giving the date but no other information). [S427] Portrait and Biographical Record of the Eastern Shore of Maryland, above, p. 131 (giving only the year and spelling her surname as Nordain). [S427] Portrait and Biographical Record of the Eastern Shore of Maryland, above, p. 131. [S961] Find A Grave, online, above, memorial for William A. Hyland, memorial no. 37264888, viewed on 23 Feb 2012. [S427] Portrait and Biographical Record of the Eastern Shore of Maryland, above, pp. 130-31. [S427] Portrait and Biographical Record of the Eastern Shore of Maryland, above, p. 131 (giving his name as Harry H. Hyland and naming William A. Hyland as his father). [S1] Ruth Bennett, Naudain Family of Delaware, above, p. 90 (naming William A. Hyland as his father). [S427] Portrait and Biographical Record of the Eastern Shore of Maryland, above, p. 131 (naming William A. Hyland as his father). [S427] Portrait and Biographical Record of the Eastern Shore of Maryland, above, p. 131 (giving her name as Annie W. Hyland and naming William A. Hyland as her father). [S1] Ruth Bennett, Naudain Family of Delaware, above, p. 90 (naming William A. Hyland as her father). [S427] Portrait and Biographical Record of the Eastern Shore of Maryland, above, p. 131 (naming William A. Hyland as her father). [S961] Find A Grave, online, above, memorial for Elizabeth C. Hyland Wilson, memorial no. 37316085, viewed on 23 Feb 2012 (naming William A. Hyland as her father). [S961] Find A Grave, online, above, memorial for William A. Hyland, memorial no. 37264888, viewed on 23 Feb 2012 (naming William A. Hyland as her father). [S1] Ruth Bennett, Naudain Family of Delaware, above, pp. 90-91 (naming William A. Hyland as her father). [S1] Ruth Bennett, Naudain Family of Delaware, above, pp. 90-91 (naming William A. Hyland as his father). Burial*: Interment was in Forest Presbyterian Church Cemetery, Middletown, New Castle County, Delaware. Birth*: He was born in 1844. Death*: He died on 4 September 1889. Note*: He served in the U.S. Navy for several years and died from injuries received in a railroad accident at Middletown, Delaware. Birth*: He was born on 9 December 1847. Death*: He died on 2 August 1849 at age 1. Birth*: He was born on 31 January 1835. Death*: He died on 17 September 1838 at age 3. [S1] Ruth Bennett, Naudain Family of Delaware (Geneva, Neb. : n.pub., 1941), pp. 71-72. This material is a typescript of "notes" in Ms. Bennett's possession and apparently was originally written and compiled by James W. Lattomus. Copies are with the D.A.R. Library, Washington, D.C., and Roger Bartlett, Austin, Tex., and can be viewed at http://www.rabgenealogy.com/ui53.htm. The notes contain some inconsistencies, and page 45 was missing from the D.A.R. Library copy when it was copied. Birth*: She was born on 20 December 1836. Death*: She died on 25 October 1873 at age 36. Note*: She had two children, one of whom, Delaware Wilson Rothwell, was a noted player on the Delaware College football team in the early 1890's. [S1] Ruth Bennett, Naudain Family of Delaware, above, p. 72. [S1] Ruth Bennett, Naudain Family of Delaware, above, p. 72 (naming Lydia R. Wilson as his mother). [S1] Ruth Bennett, Naudain Family of Delaware (Geneva, Neb. : n.pub., 1941), p. 72. This material is a typescript of "notes" in Ms. Bennett's possession and apparently was originally written and compiled by James W. Lattomus. Copies are with the D.A.R. Library, Washington, D.C., and Roger Bartlett, Austin, Tex., and can be viewed at http://www.rabgenealogy.com/ui53.htm. The notes contain some inconsistencies, and page 45 was missing from the D.A.R. Library copy when it was copied. Birth*: He was born on 6 September 1838. Death*: He died on 22 September 1890 at age 52. John Thomas Wilson, from his obituary in the Cecil Whig, Cecil, Md., 8 Mar 1902. Marriage*: He married Laura Lindsey. Birth*: He was born on 17 April 1841. Death*: He died on 2 March 1902 at age 60. [S1] Ruth Bennett, Naudain Family of Delaware (Geneva, Neb. : n.pub., 1941), pp. 71-72 (naming William Wilson as his father). This material is a typescript of "notes" in Ms. Bennett's possession and apparently was originally written and compiled by James W. Lattomus. Copies are with the D.A.R. Library, Washington, D.C., and Roger Bartlett, Austin, Tex., and can be viewed at http://www.rabgenealogy.com/ui53.htm. The notes contain some inconsistencies, and page 45 was missing from the D.A.R. Library copy when it was copied. [S1] Ruth Bennett, Naudain Family of Delaware, above, pp. 71-72 (naming Rachel Naudain as his mother). Marriage*: She married John Thomas Wilson, son of William Wilson and Rachel Naudain. Birth*: He was born on 8 May 1843. Death*: He died on 28 August 1843. Marriage*: He married Lydia Rothwell. [S1] Ruth Bennett, Naudain Family of Delaware, above, p. 72 (naming Edward Wilson as his father). Marriage*: She married Edward Wilson. [S1] Ruth Bennett, Naudain Family of Delaware, above, p. 72 (naming Lydia Rothwell as his mother). [S1] Ruth Bennett, Naudain Family of Delaware (Geneva, Neb. : n.pub., 1941), p. 72 (naming Lydia R. Wilson as his mother). This material is a typescript of "notes" in Ms. Bennett's possession and apparently was originally written and compiled by James W. Lattomus. Copies are with the D.A.R. Library, Washington, D.C., and Roger Bartlett, Austin, Tex., and can be viewed at http://www.rabgenealogy.com/ui53.htm. The notes contain some inconsistencies, and page 45 was missing from the D.A.R. Library copy when it was copied. Birth*: He was born on 27 March 1834. Marriage*: He married Martha E. Humphreys on 14 November 1848. Death*: He died on 15 March 1897 at age 62. Note*: He was a farmer in Delaware and Maryland. [S1] Ruth Bennett, Naudain Family of Delaware (Geneva, Neb. : n.pub., 1941), pp. 72-73. This material is a typescript of "notes" in Ms. Bennett's possession and apparently was originally written and compiled by James W. Lattomus. Copies are with the D.A.R. Library, Washington, D.C., and Roger Bartlett, Austin, Tex., and can be viewed at http://www.rabgenealogy.com/ui53.htm. The notes contain some inconsistencies, and page 45 was missing from the D.A.R. Library copy when it was copied. Birth*: She was born on 13 October 1833. Marriage*: She married James Hall Short, son of Alexander Darrah Short and Ann Jemima Naudain, on 14 November 1848. Death*: She died on 13 November 1896 at age 63. Birth*: He was born on 17 August 1846. Death*: He died on 26 July 1876 at age 29. Birth*: He was born on 21 November 1847. Note*: He lived in Clifton, Arizona. Birth*: He was born on 17 March 1849. Marriage*: He married Julia Rebecca Vickers on 14 January 1880. Death*: He died on 13 August 1889 at age 40. [S961] Find A Grave, online at http://www.findagrave.com, memorial for Mildred Naudain Crawford Bowersock, memorial no. 166218230 (naming Samuel H. Crawford as her father). Marriage*: She married Samuel Henry Crawford, son of Benjamin Merritt Crawford and Ann Jemima Naudain, on 14 January 1880. [S961] Find A Grave, online at http://www.findagrave.com, memorial for Mildred Naudain Crawford Bowersock, memorial no. 166218230 (naming Julia Rebecca Crawford as her mother). Birth*: He was born on 11 November 1850. Death*: He died on 20 November 1866 at age 16. Birth*: He was born on 23 November 1852. Note*: He lived for many years in Cecilton, Maryland. [S1] Ruth Bennett, Naudain Family of Delaware (Geneva, Neb. : n.pub., 1941), p. 72 (naming Benjamin Merritt Crawford as his father). This material is a typescript of "notes" in Ms. Bennett's possession and apparently was originally written and compiled by James W. Lattomus. Copies are with the D.A.R. Library, Washington, D.C., and Roger Bartlett, Austin, Tex., and can be viewed at http://www.rabgenealogy.com/ui53.htm. The notes contain some inconsistencies, and page 45 was missing from the D.A.R. Library copy when it was copied. [S1] Ruth Bennett, Naudain Family of Delaware, above, p. 72 (naming Anna Jemima Naudain as his mother). [S1] Ruth Bennett, Naudain Family of Delaware, above, p. 72 (giving her name as Blanche McBond) (giving the date but not the place). [S1365] The Sun, Baltimore, Md., online at http://www.newspapers.com, 5 Feb 1900, p. 8, col. 2 (announcement of pending wedding) (giving the date but not the place). [S1508] Cecil Whig, Elkton, Md., online at https://www.newspaperarchive.com, 17 Feb 1900, p. 1, col. 3 (marriage announcement of Dr. Edward Naudain Crawford and Blanche McCullough Bond) (stating that the "very pretty wedding" was at 11:30 a.m. with the ceremony performed by Rev. D. E. Shar, pastor of the church). 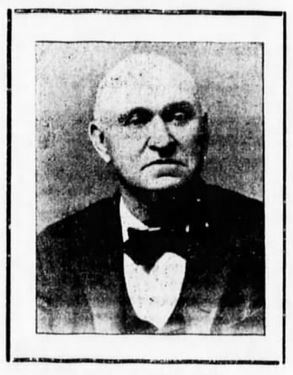 [S1508] Cecil Whig, Elkton, Md., online, above, 17 Feb 1900, p. 1, col. 3. Other Names*: Blanche Bond, Blanche McCullough Bond Crawford, Blanche Bond Crawford, Blanche McCullough Crawford, Blanche Crawford. [S1] Ruth Bennett, Naudain Family of Delaware (Geneva, Neb. : n.pub., 1941), p. 72 (giving her name as Blanche McBond) (giving the date but not the place). This material is a typescript of "notes" in Ms. Bennett's possession and apparently was originally written and compiled by James W. Lattomus. Copies are with the D.A.R. Library, Washington, D.C., and Roger Bartlett, Austin, Tex., and can be viewed at http://www.rabgenealogy.com/ui53.htm. The notes contain some inconsistencies, and page 45 was missing from the D.A.R. Library copy when it was copied. Birth*: He was born on 22 September 1854. Marriage*: He married Mary Parsons in 1882. Death*: He died in 1914. Marriage*: She married Abram Schee Crawford, son of Benjamin Merritt Crawford and Ann Jemima Naudain, in 1882. Birth*: He was born on 16 February 1856. Note*: He lived in California. Marriage*: He married Lydia Barrington Darrah circa 1808. [S1] Ruth Bennett, Naudain Family of Delaware (Geneva, Neb. : n.pub., 1941), p. 73. This material is a typescript of "notes" in Ms. Bennett's possession and apparently was originally written and compiled by James W. Lattomus. Copies are with the D.A.R. Library, Washington, D.C., and Roger Bartlett, Austin, Tex., and can be viewed at http://www.rabgenealogy.com/ui53.htm. The notes contain some inconsistencies, and page 45 was missing from the D.A.R. Library copy when it was copied. Marriage*: She married James Short circa 1808. Birth*: He was born on 1 August 1859. Marriage*: He married Clara Belle Simmons in December 1886. Marriage*: She married Alexander Darrah Short, son of James Hall Short and Martha E. Humphreys, in December 1886. Birth*: He was born on 6 October 1860. Marriage*: He married Anna Belle Foracre in March 1889. Death*: He died in January 1907 at age 46. Marriage*: She married William Chapman Short, son of James Hall Short and Martha E. Humphreys, in March 1889. Note*: He died in infancy. Birth*: She was born on 15 July 1865. Birth*: She was born on 29 April 1867. Marriage*: She married Lewis Rems. Birth*: She was born on 31 December 1868. Marriage*: He married Martha Ellen Short, daughter of James Hall Short and Martha E. Humphreys. Birth*: She was born on 6 November 1870. Marriage*: She married Ernest Weldon on 11 January 1906. Marriage*: He married Leah Rebecca Short, daughter of James Hall Short and Martha E. Humphreys, on 11 January 1906. Birth*: She was born on 4 June 1872. Birth*: He was born on 24 February 1874. Note*: He was married twice. Birth*: She was born on 24 February 1877. Marriage*: She married Harry W. Goldsborough on 9 May 1900. Death*: She died on 28 July 1901 at age 24. Marriage*: He married Estella Short, daughter of James Hall Short and Martha E. Humphreys, on 9 May 1900. Other Names*: Mildred Crawford, Mildred Naudain Crawford Bowersock, Mildred Crawford Bowersock, Mildred Naudain Bowersock, Mildred Bowersock. "Miss Crawford, School Teacher, Leaves Charge And Is Married. "Several weeks ago Miss Mildred Naudain Crawford, 540 North Fulton avenue, was appointed principal of the public school at Barnesville, Montgomery county. She was to have taken charge Monday, but when the pupils assembled they were disappointed. Later in the day Prof. Earle B. Wood, county superintendent of schools, received a short note from the new principal that she was no longer Miss Crawford, but Mrs. Albert Curtis Bowersock, and would not be able to accept the appointment. "Miss Crawford, it was learned, went to Rockville Saturday afternoon. Mr. Albert C. Bowersock accompanied her. Professor Wood entered the scene and, introducing himself to Miss Crawford, was informed that she expected to go to Barnesville that following day. "Shortly afterward Miss Crawford and Mr. Bowersock started uptown. Mr. Bowersock hunted up Deputy Clerk Talbott. He quickly secured a marriage license, and almost before Miss Crawford had forgotten her arrangement with the school superintendent Rev. Thomas J. Packard, a Rockville minister, had been sent for and she had become Mrs. Bowersock. • Her Find A Grave memorial, which includes some biographical information and a picture of her tombstone, is here. [S961] Find A Grave, online, above, memorial for Mildred Naudain Crawford Bowersock, memorial no. 166218230 (naming Julia Rebecca Crawford as her mother). [S961] Find A Grave, online, above, memorial for Mildred Naudain Crawford Bowersock, memorial no. 166218230. [S961] Find A Grave, online, above, memorial for Mildred Naudain Crawford Bowersock, memorial no. 166218230. Her memorial includes this item, attributed to Kent News, 23 Jan 1909: "Miiss Mildred Naudain Crawford, daughter of Mrs. Julia Rebecca Crawford and the late Samuel H. Crawford of Kent County, and Mr. Albert Curtis Bowersock, of Baltimore, were married at Rockville, MD, by the Rev. Thomas J. Packard, rector of the Protest Episcopal Church of that place. Mr. Bowersock is employed in the relief department of the Baltimore and Ohio Railroad in Baltimore. Mr. Bowersock gave his age as 31 and that of his bride as 25." [S1365] The Sun, Baltimore, Md., online at http://www.newspapers.com, 24 Jan 1909, p. 7, col. 6 ("She Preferred a Class of One"). [S1365] The Sun, Baltimore, Md., above, 8 May 1948, p. 15, col. 1 (obituary of Mildred Naudain Crawford). [S961] Find A Grave, online, above, memorial for Mildred Naudain Crawford Bowersock, memorial no. 166218230 (stating that she died in May 1948 in Baltimore, Maryland). [S1365] The Sun, Baltimore, Md., above, 24 Jan 1909, p. 7, col. 6. [S198] Supposition as to mother's identity, based on cemetery monument bearing both names. Obituary*: "DEATH OF R. L. NAUDAIN. "Special Correspondence of Every Evening. "Middletown [Del. ], Oct. 17 .—Richard L. Naudain, who was stricken with paralysis on Sunday night, died at 8 o’clock Thursday evening [15 Oct 1908], without regaining consciousness. "Mr. Naudain was one of the best-known farmers in this vicinity. His wife, who was formerly Miss Lillian Y. Cann, and one son, Louis M. Naudain of Wilmington, survive him." Note*: • He was born and died on his father's farm near St. Anne's Church and spent much of his life there. He lived with his mother's father, Richard Lockwood, after being orphaned at age 13. After schooling at Middletown Academy and Newark Academy he clerked for a few years in general stores in Middletown and Newark, Delaware and, in 1874, began running the family farm, which four years later he bought from his siblings. He concentrated in fruit and pure-bred cattle. He was a Democrat and a member of Forest Presbyterian Church in Middletown. • An 1899 biography of him is here. [S1] Ruth Bennett, Naudain Family of Delaware (Geneva, Neb. : n.pub., 1941), pp. 73-74, 91. This material is a typescript of "notes" in Ms. Bennett's possession and apparently was originally written and compiled by James W. Lattomus. Copies are with the D.A.R. Library, Washington, D.C., and Roger Bartlett, Austin, Tex., and can be viewed at http://www.rabgenealogy.com/ui53.htm. The notes contain some inconsistencies, and page 45 was missing from the D.A.R. Library copy when it was copied. [S1] Ruth Bennett, Naudain Family of Delaware, above, p. 91 (naming John M. Naudain as his father). [S961] Find A Grave, online at http://www.findagrave.com, memorial for Richard Lockwood Naudain, memorial no. 66374190, viewed on 1 Jul 2018 (giving the date but not the place). [S1343] Journal-Every Evening, Wilmington, Del., online at http://www.newspapers.com, 17 Oct 1908, p. 8, col. 1 (obituary of Robert L. Naudain) (naming the former Lillian Y. Cann as his widow). [S1441] Wilmington Morning News, Wilmington, Del., online at http://www.newspapers.com, 7 Feb 1934, p. 2, col. 2 (obituary for Mrs. Lillie J. Naudain) (stating that she was his widow without giving any other information). [S1343] Journal-Every Evening, Wilmington, Del., above, 17 Oct 1908, p. 8, col. 1 (obituary of Robert L. Naudain) (giving the date but not the place and stating that he died at 8:00 p.m.). [S961] Find A Grave, online, above, memorial for Richard Lockwood Naudain, memorial no. 66374190, viewed on 1 Jul 2018. [S1343] Journal-Every Evening, Wilmington, Del., above, 17 Oct 1908, p. 8, col. 1 (first bullet). [S1508] Cecil Whig, Elkton, Md., online at https://www.newspaperarchive.com, 24 Oct 1908, p. 1, col. 5 (second bullet). [S1] Ruth Bennett, Naudain Family of Delaware, above, p. 91 (first bullet). [S1343] Journal-Every Evening, Wilmington, Del., above, 17 Oct 1908, p. 8, col. 1 (obituary of Robert L. Naudain) (second bullet). [S1] Ruth Bennett, Naudain Family of Delaware, above, p. 91 (naming Richard Lockwood Naudain as his father). [S1340] The Morning News, Wilmington, Del., online at http://www.newspapers.com, 8 Nov 1948, p. 4, col. 4 (obituary of Richard L. Naudain) (naming Richard Lockwood as his father). Other Names*: Lillian Y. Cann Naudain, Lillian Cann Naudain, Lillian Y. Naudain, Lillian Naudain, Lillie J. Cann Naudain, Lillie Cann Naudain, Lillie J. Naudain Lillie Naudain. [S1] Ruth Bennett, Naudain Family of Delaware (Geneva, Neb. : n.pub., 1941), p. 91 (naming Richard T. Cann as her father). This material is a typescript of "notes" in Ms. Bennett's possession and apparently was originally written and compiled by James W. Lattomus. Copies are with the D.A.R. Library, Washington, D.C., and Roger Bartlett, Austin, Tex., and can be viewed at http://www.rabgenealogy.com/ui53.htm. The notes contain some inconsistencies, and page 45 was missing from the D.A.R. Library copy when it was copied. [S1441] Wilmington Morning News, Wilmington, Del., online at http://www.newspapers.com, 7 Feb 1934, p. 2, col. 2 (obituary for Mrs. Lillie J. Naudain) (naming Richard T. Cann as her father). [S1441] Wilmington Morning News, Wilmington, Del., above, 7 Feb 1934, p. 2, col. 2 (obituary for Mrs. Lillie J. Naudain) (naming Jeanett Cann as her mother). [S1441] Wilmington Morning News, Wilmington, Del., above, 7 Feb 1934, p. 2, col. 2 (obituary for Mrs. Lillie J. Naudain) (not giving the date but stating that she was eighty years old when she died on 4 Feb 1934). [S961] Find A Grave, online at http://www.findagrave.com, memorial for Lillie J. Cann Naudain, memorial no. 66374185, viewed on 1 Jul 2018. [S1441] Wilmington Morning News, Wilmington, Del., above, 7 Feb 1934, p. 2, col. 2 (obituary for Mrs. Lillie J. Naudain) (stating that she was his widow without giving any other information). [S1441] Wilmington Morning News, Wilmington, Del., above, 7 Feb 1934, p. 2, col. 2 (obituary for Mrs. Lillie J. Naudain) (stating that she was visiting in Westfield, N.J. when she died). [S961] Find A Grave, online, above, memorial for Lillie J. Cann Naudain, memorial no. 66374185, viewed on 1 Jul 2018 (giving the date but not the place). [S1441] Wilmington Morning News, Wilmington, Del., above, 7 Feb 1934, p. 2, col. 2 (obituary for Mrs. Lillie J. Naudain) (stating that she would be interred in "St. Ann's cemetery"). [S1] Ruth Bennett, Naudain Family of Delaware, above, p. 91 (naming Lillie J. Cann as his mother). [S1340] The Morning News, Wilmington, Del., online at http://www.newspapers.com, 8 Nov 1948, p. 4, col. 4 (obituary of Richard L. Naudain) (naming Lillie Cann as his mother).